We're referring to his bold prediction that global index provider MSCI would agree to add domestic Chinese stocks – known as "A-shares" – to its emerging markets index last year... and that these stocks were practically guaranteed to move higher as a result. I predict – for the first time in history – MSCI will finally include Chinese A-shares in its global indexes. This is a big change. And it likely affects you, even if you don't realize it. You are about to start owning local Chinese stocks in your pension fund – for the first time ever. Right now, 94% of U.S. pension funds that are invested in global stocks are benchmarked to MSCI's indexes. So if you're a teacher, a firefighter, or anyone else with a decent pension fund, you will unknowingly start owning local Chinese stocks for the first time... very soon. Later that day – at 4:30 p.m. Eastern time – MSCI made it official. It would begin to add Chinese A-shares to its benchmark emerging markets index approximately one year later in mid-2018. More important, shares have rallied dramatically, just as Steve predicted. Despite recent fears of a "trade war" with China, subscribers who took his advice are up more than 20% so far. MSCI handles changes to its indexes all the time. It moves countries up and down its rankings every few years. 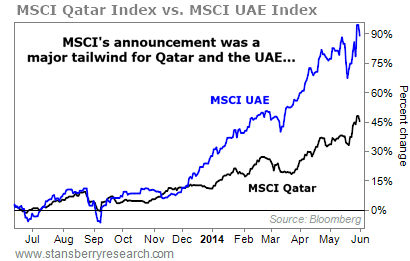 The last two countries MSCI elevated were Qatar and the United Arab Emirates (UAE). Both were considered frontier markets – or developing countries that are too small to reach the next category – until MSCI announced in 2013 that it would re-classify them as emerging markets. 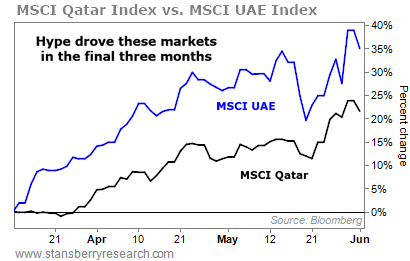 Qatar rallied more than 50% over this period, while the UAE nearly doubled. The hype an index gets when the flood of money from MSCI is coming is huge. And the biggest gains tend to happen right at the end. In short, both these indexes saw more than half their massive returns in the final few months before MSCI started buying. This is great news for Steve's favorite A-share investments. We mentioned the recent fears of a trade war between the U.S and China. Many of Steve's favorite China opportunities – including these A-shares investments – have fallen 10% or more as tensions have risen over the past several weeks. But Steve believes these fears are overblown... In reality, Chinese stocks enjoyed a massive rally over the past year, and were overdue for a correction. According to news service Reuters, Chinese fund managers have slashed their equity exposure to the lowest level in 18 months. Even Chinese investors don't want to own these stocks right now... which means the rush back into A-shares over the next few months could be incredible. Thanks to the recent sell-off, all 22 of Steve's top China recommendations are "on sale," and he rates them all strong buys today. If you missed out on the big rally last year, this could be your last great chance to get on board this multiyear bull market. To be sure every interested reader has one last chance to take advantage, Steve has agreed to open up his True Wealth China Opportunities service to new subscribers at the best price we have ever offered. But please note, this special offer will only be available until tomorrow night at midnight Eastern time. Click here for all the details.